Dr. Martin R. Coleman, MD | Shoulder Surgery | Newport News, VA.
Dr. Martin Coleman is a sports medicine physician and orthopaedic surgeon who joined OSC in 2002. Dr. Coleman received his undergraduate degree at Harvard College, and went to medical school at the New York University School of Medicine. Upon completion of medical school, he interned and did his first year residency in General Surgery at the Hospital of the University of Pennsylvania. Dr. Coleman then completed his residency in Orthopaedic Surgery at the same facility. His first appointment was in Orthopaedic Surgery at United Hospital Center in Clarksburg, WV. 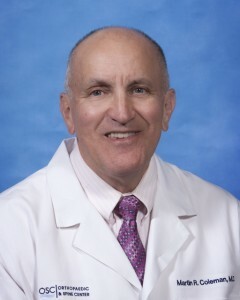 Dr. Coleman opened his own practice in 1985 in Havertown, PA, which he operated until relocating to Hampton Roads, Virginia, to join OSC in 2002. Dr. Coleman’s practice includes orthopaedic and sports medicine, but he has a special interest in the care and treatment of disorders of the shoulder. As the technology has advanced over the years, he has adapted arthroscopic surgical techniques to treat severe tendonitis and rotator cuff tears almost exclusively by way of minimally-invasive techniques that result in a more comfortable recovery for his patients. Dr. Coleman is also especially excited about reverse total shoulder arthroplasty, a type of replacement that can provide a solution for patients with arthritis and chronic cuff tears who could not be helped in the past. In addition to his extensive medical commitments, Dr. Coleman enjoys traveling, movies, good books and spending time with his family. Contact Orthopaedic & Spine Center in Newport News, VA, to set up an appointment with Dr. Martin Coleman or one of our other orthopedists.